As if you weren't excited enough we're featuring Tea Collection for the Back 2 School Event, we are doubling the fun with Umi! What a perfect pairing! Kids grow out of shoes so fast, it seems like there is never enough. 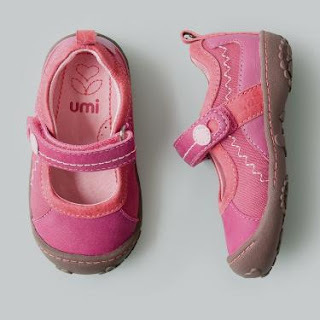 I am a huge fan of quality children's footwear like Umi - shoes that last through the season and then some without falling apart. We are giving away a $60 Umi Gift Card during the Back 2 School Event, come back Tuesday July 17th to enter! Umi was generous to offer a pair of shoes both for Baby E and Baby T. My infant doesn't walk yet, but he will be 8 months next week, so he is definitely in the I-don't-want-to-sit-anymore-help-me-get-up stage. I measured his foot and according the the Umi sizing chart he was exactly a size 19, so I picked a pair of sandals that he can wear outdoors now when he attempts to walk and through the fall with a pair of socks. Going barefoot is very beneficial for baby feet, so we do that at home, but when outside we do not have a safe place for barefoot walking. Turns out size 19 was too big for him, they are roomy and will fit perfectly next spring and summer. It's a good thing for us because I don't see any signs of confident, independent walking in his immediate future - so I'm happy we'll have these when he is 18 months and walking on his own. 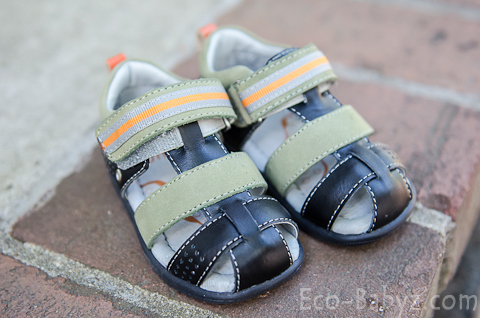 For Baby E we picked the Bodi shoes in Charcoal from the new Umi Fall Collection. Since she already has so much pink in her wardrobe and I like passing shoes down from sibling to sibling, we decided to go gender neutral. I actually like when girls are not head to toe girly, but wear some neutral or even boyish clothing or accessories. We ordered exactly according to the sizing chart and they fit her well with lots of room for growth. She'll be wearing them this fall, winter, and spring, they are perfect with a pair of jeans or pants. I like the rugged yet sophisticated look. 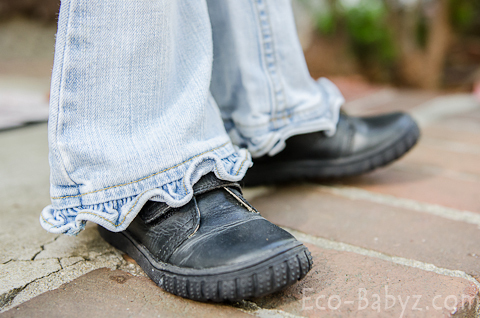 Another thing we love - they are so easy for my toddler to put on! She gets frustrated with some shoes, but this pair she can put on herself without tears. I also like that the hook and loop closure is not just on the end of the strap, but also in the middle, it keeps them from opening unexpectedly and sturdier on the feet. The quality of Umi shoes is absolutely outstanding! They are not cheap, but they will not fall apart like some shoes do. They are made to withstand the abuse of toddlers and kids through every day wear. Not only that, the soles are flexible and there is plenty of toe room for developing feet (I hate seeing kids in stiff shoes that are bad for development). The Bodi shoes cost $60 a pair and the sandals are actually not available anymore but there are still some sandals like the Payton, Harrley, and Keelback (all at $50 a pair). The fall collection is gorgeous! There are so many shoes we love. Baby E loves pink, and if I would get her another pair for fall it would probably be the Cerise below, it would satisfy her pink craving and would be perfect to wear with dresses, tights, or leggings. 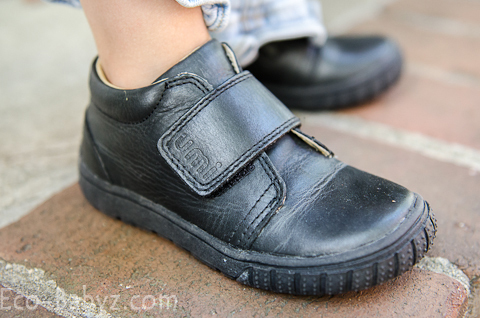 It would satisfy my craving for comfortable, flexible sole kids shoes. Don't forget to come back Tuesday, July 17th to enter the giveaway! I am a sucker for pink shoes! Love the styles and color choices for girls! I love these shoes! They look like such great quality! I really like the bodi shoes. They have such a great collection to choose from! Thanks for the info... My little one is walking & about to outgrow her 1st pair of shoes / sandals. We don't have a lot of kids stores hereabouts -- so I appreciate the help navigating the web. What can i say, I'm picky about shoes and this quality looks great. My daughter has had two pairs of Umi shoes, and not only are they gorgeous, but they are made well and last! I love those Bodi shoes, especially with her wearing ruffled jeans. Too cute! Kids do grow out of shoes so quickly but they need ones that are well-made, too. Who doesn't love Umi shoes? They're stylish and so well made. One of these days I'd love to pick up a pair of their boots for my oldest.. They are nice but my boys feet grow too fast to spend that much on shoes! Umi shoes are great. They look nice, but they're also great for children's developing feet. I need to get some for my grandson. I love some of the styles Umi has but they are a little out of our price range for a pair of shoes that will be outgrown in a few months! Would love to win this so I could actually buy a pair! My son loves his Bodi shoes. We are already on our second pair! I love how sturdy these seem--girls shoes are so often flimsy. I just heard of this company about a week ago and oh my goodness, I LOVE the look of all these shoes. They seem very durable. If you buy a $10 pair at Payless, they're destroyed in a week and what's the point in that? You'll buy 4 pairs in one summer! It would be much wiser to buy one fantastic pair that lasts! my 3 year old grandson has worn their shoes since he was little...great shoes! I love that they are easy for kids to put on- independence is so important, and I want to foster that in my son- not frustrate him! When he can get dressed by himself, he is so proud! I keep that in mind when I purchase his shoes. Not only are they easy to wear- they are so unique! You can't buy shoes like this just anywhere. Love them! I love their boys shoes. 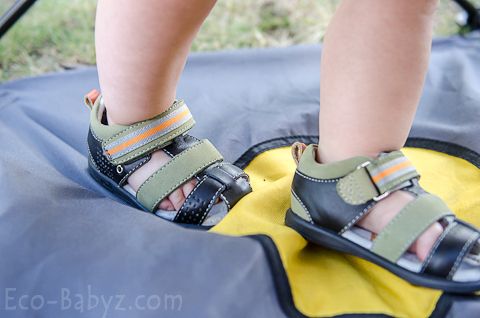 My son has flat feet and it is hard to find shoes that look good on him especially sandals. So I think that Umi has cute sandals for boys. I follow Umi on Twitter and Facebook. I love the Tyler ones. These would be so cute on my boys.